The launch of the new Nissan NV400 van here will mark the next step in Nissan's ambitions to grow its presence in the LCV market in Ireland and across Europe. Nissan's bold plan to double its share of Europe's LCV market within three years has been given a boost by the European debut of the NV400, its new bigger capacity van. It will go on sale here soon. Developed in cooperation with alliance partner Renault, the NV400 cannot be mistaken for anything other than a Nissan. Its distinctive ‘face’ was created at Nissan Design Europe and engineered by Nissan Technical Centre Europe. The NV400 has its own unique bonnet, front wings, headlamps with integrated daytime running lights, grille and front bumper. The result gives NV400 a rugged, assertive look that shows it means business. But Nissan points out that there is much more to the NV400 than the way it looks. It claims it is one of the most versatile and practical heavy van ranges on the market with gross vehicle weights ranging from 2.8t to 4.5t. For the first time, Nissan can offer the choice of front or rear-wheel drive versions, while NV400 comes in three wheelbase versions, four different lengths, three different heights, and with cargo volumes ranging from 8m3 to 17m3. There are three power options plus six-speed manual and robotized transmissions. At the time of writing, we do not know the line-up or specification levels that will be offered in Ireland, but that will be announced in the near future. There are also many different bodywork options offered in Europe, and all backed by the Nissan warranty. As well as factory-built panel vans and combis, there are crew vans, box-bodies, tippers and dropsides, all built in house. Nissan says it will also continue to build chassis-cabs for specialist body builders. From a practical perspective, the NV400 offers a far wider range of model types, sizes and options than the outgoing Interstar. 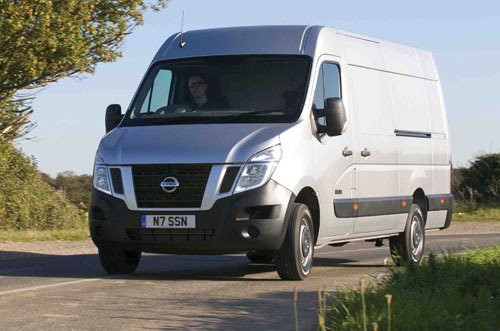 Operators have the choice between front or rear-wheel drive versions for the first time with Nissan vans. Front-wheel drive means a lower kerb weight for improved payloads, a lower frame height, and improved fuel economy. Rear-wheel drive offers greater choice for chassis cab conversions and thanks to its high-rear axle capacity it is better suited to medium duty applications. Rear-drive versions are available with single or twin rear wheels. Power comes from a direct injection, four-cylinder, 16-valve turbo diesel engine that has been newly developed by Renault. At 2.3-litres it is smaller than Interstar's 2.5- dCi unit, yet power outputs are the same - 100, 125 and 150bhp - and torque figures have improved to 285, 310 and 350Nm respectively. Nissan tells us all are Euro 5 compliant and enjoy lower running costs, thanks to improved economy and to major service intervals which have been extended to 40,000kms or every two years. Watch this space for more details on the Irish range, specifications, and prices closer to the launch here.